Scooper - Technology News: How can we reduce the risk of climate disasters? How can we reduce the risk of climate disasters? Broadening the focus of the climate change agenda, the global policy debate has recently acknowledged the reality that adaptation and resilience need to be at the forefront of the climate change discourse. It’s a welcome sign not just for the societies that are most affected, but also for the business communities that operate in such risk-prone situations. The recently publication “ The Global Risks Report 2016 ” by the World Economic Forum highlights that climate change is perceived as a top business risk. This assessment by 750 experts reviewed 29 specific global risks for both their potential impact and their likelihood over a 10-year time horizon. The findings are no great surprise. The numbers on economic impacts from recent disasters provides a similar story. A slew of recent natural disasters has caused severe economic damage, with ripple effects affecting many other aspects of society and the economy. The 2011 floods in Thailand caused a loss of US$45.7 billion in total damage and loss – approximately 5 percent of GDP, of which $32 billion can be attributed to losses in manufacturing. Floods in Chennai in December 2015 caused a total of $2.2 billion in losses in the automotive sector and severely disrupted India’s burgeoning ICT sector. Since those floods, Ford, Daimler, Apollo Tyres, Renault-Nissan, BMW and Hyundai Motors have all halted production in India. An additional $300 million loss is expected among MSMEs . The 2014 floods in the Balkans affected 19 percent of manufacturing units in Serbia alone. The Serbian manufacturing sector faced $77 million in damages and $89 million in overall economic losses, coupled with a total of $95 million for the costs of recovery and reconstruction. 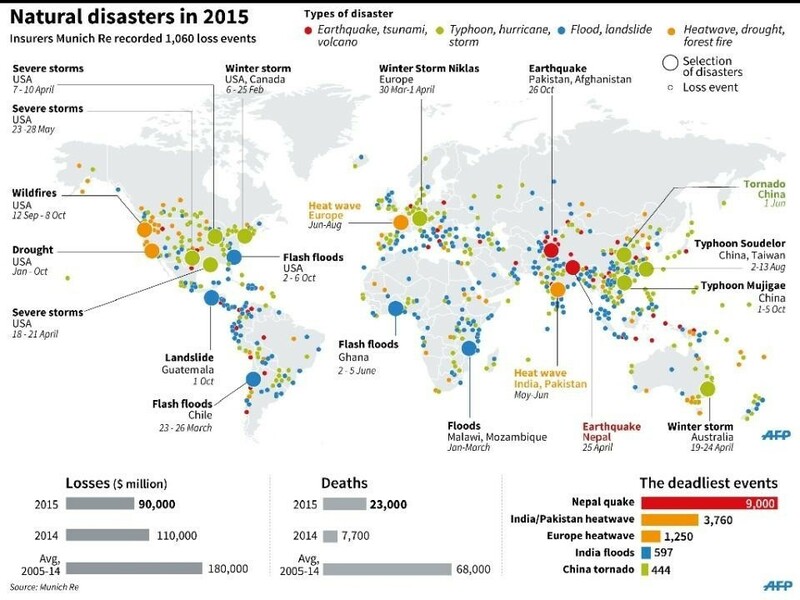 The number of continuing climate-related disasters is growing. Other countries that have been able, thus far, to avoid climate disaster are still at risk. In Vietnam’s Ho Ci Minh City, 61 percent of urban land use and 67 percent of industrial land use is expected to be flooded by 2050 if proposed flood-control measures are not implemented. In addition, 50 percent of industrial zones (IZs) are at risk of flooding due to extreme events, even if the proposed flood-control measures are in place. An additional 20 percent of IZs are located within 1 kilometer of areas likely to suffer inundation. Develop a disaster-risk response that incorporates economic losses as a second response to humanitarian crisis. Giving people the chance to get back to work is crucial. In the wake of the 2010 earthquake in Haiti, a rapid response by IFC to the economic needs of the country helped the country retain supply-chain investors, create jobs and revive economic growth. Psychologically, it was important for Haiti’s people to be reassured about the stability of their jobs. In Thailand, Rojana Industrial Estate completed a 75-kilometer concrete wall in 2013 to protect the 213 factories in the zone and to reassure investors.Build and upgrade industrial infrastructure better. According to the WEF, the global infrastructure gap is estimated at $3.7 trillion annually, with only US$ 2.1 trillion is invested each year. The demand for infrastructure should take into account disaster risk and vulnerability, requiring governments to make smart decisions about the type of infrastructure and its performance under increasing climate stress. As described by the WEF, this can be done by reducing demand, building new assets and optimizing existing assets. One can look at this from a climate perspective by focusing on promoting eco-industrial development by reducing resource use and promoting circularity to reduce infrastructure demand; by working with the private sector to ensure that new industrial infrastructure integrates climate risks and shocks; and by reviewing existing port and transport infrastructure for risks and vulnerabilities. Engage in meaningful public-private dialogue to identify business challenges and concerns and to help prioritize climate -related measures. More than ever, preparing for broad-scale climate change, with its many cross-industry implications, requires public-private dialogue to help build trust, close the knowledge gap, catalyze action, and generate a sense of shared ownership. Among the key components of effective dialogue will be:to promote voluntary actions that the private sector, the public sector and citizens can undertake;to advance legal and regulatory reforms to encourage innovation, to promote the use of new technologies and inputs, to incentivize Public-Private Partnerships, and to reward positive behavior while penalizing negative behavior;to ensure the availability of and access to finance for businesses and citizens who will be affected by climate change; andto pursue strategies to encourage behavioral change – such as the global event on “ Dialogue for Climate Action ,” now being organized by the World Bank Group, to promote more inclusive measures. That conference – in Vienna, Austria on May 24 and 25 – will be the venue for the launch of an eagerly awaited new World Bank Group report, “A Greener Path to Competitiveness.”Many countries’ economies face serious exposure to risk, with their infrastructure needs far exceeding their resources and capacity. The pressure for governments now is not to wait until a disaster strikes to “build back better.” Instead, the urgent need is to build better now, and to thoroughly assess current risks to industrial infrastructure. One of the leading institutions in such efforts is the Global Facility for Disaster Reduction and Recovery (GFDRR). Two of its central priorities, resilient recovery and disaster risk financing , directly involve building back better and engaging with the private sector. GFDRR's efforts are now especially timely: Recovering from disasters and building resilience in fragile and post-conflict situations will be the focus of a flagship Resilience Dialogue event that GFDRR is hosting at 12 noon on March 1 – livestreaming the event on the opening day of t he World Bank Group Fragility, Conflict and Violence Forum 2016 . The development community must be equipped with the right tools – financial as well as technical – in order to respond effectively to the threats posed by climate change. Resilience and response to natural disaster surely need to prioritize humanitarian aspects – and a second line of defense needs to come to the rescue of the economy and the private sector, hoping to prevent the further post-disaster intensification of poverty in countries damaged by the impact of climate-related shocks.